Rhys Bowen: I was a fan of historical novels long before I started to write them and I'm always thrilled when I stumble upon a series set in my favorite time period--the turn of the Twentieth century. When most writers decide to write a historical novel they have to turn to books and the internet for their research. 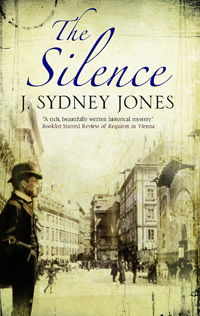 J. Sydney Jones, author of The Silence, has personally experienced the historical setting for his novels: the city of Vienna, whose old center remains little changed since the early 1900s when his books take place. Welcome to Jungle Red, Syd, and thank you for writing such an intriguing book. I spent a lot of time in Vienna as a teenager and I love the way you have brought those old streets and buildings to life. So first of all, how did a farm boy from South Dakota wind up in Vienna? J. Sydney Jones: We left South Dakota and farming when I was five. I grew up on the coast of Oregon and pure serendipity took me to Vienna. I studied there on a junior-year-abroad program in college and fell in love with the Austrian capital--the first big city I had ever lived in. This was 1968, when, as a dear friend of mine liked to say, Vienna was still in the Moose Lodge stage of development. My landlady rationed my baths to once weekly; there were roughly torn squares of the daily Kurier newspaper dangling on a string from a bent nail in the clo to be used as toilet paper; beer, of a delicious species I had never known existed, was fifteen cents the pint; a good schnitzel cost less than a buck; ten p.m. was considered late; Bill Haley and His Comets still had pride of place in juke boxes. It was love at first sight. I stayed on for a couple of decades--with diversions to Paris, Florence, Greece, and Ireland. But I always returned to Vienna. It was where I became a writer. Vienna served as my Paris for the next decades: it was cheap, friendly, accommodating, full of music, and bristling with spies. In The Silence, Werthen is puzzling over the suicide of a city councilman--a former client, next in line to Vienna’s powerful Mayor Karl Lueger, and the last man Werthen would think capable of suicide. Werthen, however, has little time to ponder, as he is summoned by wealthy industrialist Karl Wittgenstein to find his oldest son, Hans, who has gone missing. Werthen soon discovers the whereabouts of the musically-minded Hans, and the case appears to be solved. But appearances are deceiving, and a simple missing person’s case soon leads back to the councilman's suicide. Werthen journeys into a sinister web of deceit and violence that threatens not only his life, but also the very heart of the city and the empire. Rhys: Did you always know you wanted to write mysteries? Syd: I always liked reading mysteries--a guilty pleasure. I started out with travel books and walking guides, moved to narrative history with my Hitler in Vienna, and then to thrillers. Those were my bread and butter before the Viennese Mysteries. I feel as if I have finally come to my true writing home with these books. They allow me a happy blend of research and fiction. As the series progresses, I have become more familiar with Werthen, his family, and friends. It is an association I hope to cultivate for many years. Rhys: One thing I find fascinating about your books is the number of real people who walk across your pages. Did you have any ambivalence about using real people in a fictional setting? I used to be very concerned about the use of actual historical figures in my fiction. With the second novel in the series especially, Requiem in Vienna, I feature Gustav Mahler and Werthen's attempts to protect the composer and conductor from attempts to kill him. While writing, I was very aware that Mahler's descendants were still alive and here I was portraying him as not always the most likable person. In fact, there were quite a few in Vienna at the time who might have wanted him dead for one reason or another. Long story short, my fears were unfounded. In fact, a major biographer of Mahler, Henry Louis del la Grange, liked the book and saw to it that Mahler's granddaughter, Marina, was presented with a copy. I guess the one bit of advice I can give to other writers working in historicals is to take the research seriously, but always remember the publisher's disclaimer at the front of the book: "This is a work of fiction. All of the characters, organizations, and events portrayed in this novel are either products of the author's imagination or are used fictitiously." Rhys: Why do you think historical novels are suddenly so popular? Syd: I don't know that it is so sudden. After all, Regency romances have been the comfort zone for many readers and writers for decades. And some of the earliest works we think of as novels, such as Romance of the Three Kingdoms, brought historical fiction to a wide readership. Then think of the novels of Sir Walter Scott or Victor Hugo--even Tolstoy's War and Peace is at heart a historical novel. But you're right, currently there does seem to be increased interest in historicals, and I take it as a positive sign of increased literacy--in the broadest sense--and inherent human curiosity coming to the fore. 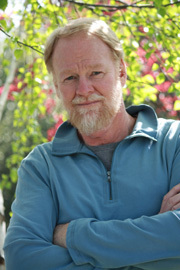 Mainstream literature as well as genre fiction, such as mysteries, employ the form. In part the popularity of historical fiction is about painless education. I love reading historicals myself just for the insight into another age. Rhys: What is next for your lawyer-sleuth, Werthen? Werthen and company are up to their eyeballs in several cases in my next work, Keeper of the Hands, including the murder of a prostitute, the beating of a prominent author, Arthur Schnitzler, and the domestic difficulties of peace activist--and first recipient of the Nobel Peace Prize--Bertha von Suttner. Not to give too much away, but these cases morph into an espionage thriller à la 1900. This fourth series installment will be out early next year. Rhys: You’ve now settled in central California—are you done with Europe for good? Which do you prefer, Europe or US? I would love to spend some time in Europe now and introduce our eight-year-old son to it. But I doubt there will be a major move now. We love the coast of California. RHYS: Thank you for visiting us and let me recommend these exciting and fascinating novels. Welcome to Jungle Red Syd! I love historicals as well, and for me, it's as much about escape into another era a education. But I was wondering, when you included Mahler, did you feel compelled to stick to all the real details about him? Or did you give yourself poetic license? Thank you for this excellent interview, Rhys and Syd! I was not aware of your Vienna mysteries, Syd, and they sound right up my alley. I'll have to make a trip to the bookstore today, I see. Welcome! I think we are seeing a real resurgence of historical fiction and drama. Since I'm a huge fan of that type of book or film, I'm strongly in favor of it. The trick is to keep the quality. I think the only thing that drives it out of popularity for periods of time is the publishers and producers trying to catch wave with poorly researched and written, shoddily produced books and films. Now's the best time near the beginning when all of our choices in the field are top-notch. Syd, will you bring Karl through the wars? Won't that change the feel of the books somewhat? Hi Syd! Thanks for visiting JR. I hadn't run across your books--my failing--so now am going to look for them. As Linda said, these are right up my alley. And I'm sure when I read your books I'll want to visit Vienna, as it a city I've missed in my travels. For those interested in Vienna at the turn of the 19th century, I highly recommend Teresa Grant's Vienna Waltz, which takes place there during the Congress of Vienna. PS, Syd-- LOVE your cover! I like your premise of taking historical figures from that period in Vienna and building stories around them... and what a time it was! There and in Paris an London. How fascinating! Which comes first--the characters or the mystery?